This is a longer version of a story that was first published by Alternative Media Group in mid June 2015. 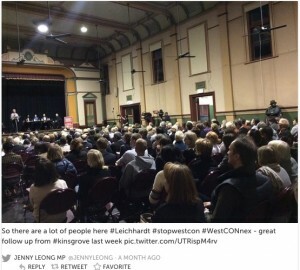 Hundreds of residents packed into Leichhardt Town Hall on June 16 to call for an “immediate halt” to all home acquisitions and work related to the WestConnex motorway. The event was the latest in a string of public meetings organised to stop the 33 kilometre motorway that the Baird government plans to build across Sydney. 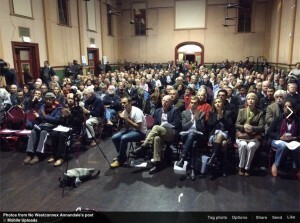 The meeting, organised by No WestConnex Annandale, unanimously passed a motion calling for a parliamentary inquiry to investigate “environmental and health aspects, business case and tender and construction process” for the project. Another motion called for the $15 billion cost of the project to be redirected to “building public transport infrastructure” across the entire Greater Sydney region. President of the NSW Branch of the Public Health Association of Australia (PHAA) Jude Page told the meeting she was disappointed with NSW Minister for Roads Duncan Gay’s statements that there was no need to worry about health impacts of the motorway. Page said Gay was wrong and that “disregarding the health of people affected by infrastructure is unethical at best”. She described the findings of a research review by PHAA, which led to warnings that tunnel pollution could cause asthma and heart attacks. Medical experts are particularly concerned about ultra-fine particles that are carcinogenic and according to the World Health Organisation “belong in the same potentially deadly category as asbestos, arsenic and mustard gas”. Page said that the design and height of ventilation stacks and portals can reduce pollution, but the Baird government has adopted designs for the NorthConnex tunnel in northern Sydney that are well below world’s best practice. The audience clapped Greens Transport spokesperson and engineer Mehreen Faruqi when she said that it was time for Mr Gay “to catch a train into the real 21st century to see what is happening around the world”. “More motorways will bring more cars and trucks onto these tunnels, and I’m afraid they will still be emitting toxic poisonous pollution and more of it. Hiding them in a tunnel will not magically make the toxic emissions go away, ventilating tunnels will just shift pollution to new locations… This is dangerous, unsafe and out-dated infrastructure,” Faruqi said. Labor’s Shadow Minister for Roads Jodi McKay, who lives only 300 metres from a planned Haberfield pollution stack, delivered a stinging attack on the Baird government’s lack of accountability and its failure to release information about WestConnex. This was well received by the crowd. She supported a parliamentary inquiry, after telling the author a week ago she was not sure it was needed. But the position of NSW Labor, which went to the recent NSW election supporting both the M4 and duplicate M5 tunnels, came out of the meeting looking weak. This was highlighted when long term resident Colin Menzies drew on his experience forty years ago when he was part of a famous protest in Fig Street Ultimo against a freeway going through Glebe. Labor leader Neville Wran joined the protestors and later when elected to government in 1976 stuck by his promise to stop the road. Menzies asked McKay whether she would “stand by residents” if the meeting resolved to oppose WestConnex. Mackay answered that the position Labor took to the election remains its policy. In an attempt to mollify her audience, McKay referred to recently elected Summer Hill MP Jo Haylen who openly opposes the WestConnex that will dislodge hundreds of residents and impact thousands more in her electorate. Thousands of residents in McKay's electorate will also be impacted by acquisitions, pollution stacks, increased traffic on Parramatta Road and local roads and many months of noise, vibration and trucks movements. McKay also said that if the business case didn’t support the project, Labor may yet reconsider its support for WestConnex. Although Westconnex has been letting a constant stream of contracts for the project, the business case is still being developed. Another resident asked McKay: “You are surrounded by… experts who say ‘it won’t work, its deadly… What is it that the Labor party knows that means that even though all these people are against it, (you say) we support it in principle because… ?” She invited McKay to complete the sentence. Instead of doing so, McKay said the Westconnex was “a reality” and there was no election for four years. At which point Greens’ Faruqi intervened by saying that a strong grassroots movement had succeeded in discrediting the project by showing that there was no evidence that it would work. She said that there were “voices in parliament standing up and shouting out against the project” but success in changing the government’s mind would depend on the growing grassroots movement. “We cannot give up hope on that. We can stop it,” she said. One of Australia’s leading experts on planning, City of Sydney Councillor John Mant then told the audience of a point around which Sydney urban planners are becoming increasingly vocal. That the continual emphasis on roads to bring cars to the CBD on the eastern edge of Sydney is fundamentally misguided. “We have to bring on board western Sydney… because the NSW Baird government has turned it into an ‘us and them’ argument. Western Sydney doesn’t need this road. What they need is $20 billion for public transport and fixing some roads in western Sydney”. The greatest challenge facing the Annandale group is to uncover and make public all the potentially adverse affects of Wstcnx such health risks, traffic congestion and lack of funds for public transport. We also aim to change people's perceptions about what is possible, dispel the myth that ' it is too late' & ' we can't do anything' and motivate them to to reject this monstrous hydra. Butterworth explained that although the Westconnex Delivery Authority has released maps last year showing that the M4 tunnel will exit not far away in Rozelle, little detail is known about the route, exit portals and smoke stacks in the Annandale/Leichhardt area due to a lack of public consultation and information. "We the residents have been given no option other than to wait for piece-meal announcements dribbled out at intervals, which is of course a deliberate attempt to keep us divided," she said. "Our next step is to join up with all those residents along the whole route of the Westconnex and show the govt that they can not treat citizens with such contempt." *Join the campaign here )and Follow on Facebook here.